Bloom has been on my list for quite awhile now and it finally got bumped up to the top of my Amazon cart and made its way to my door. 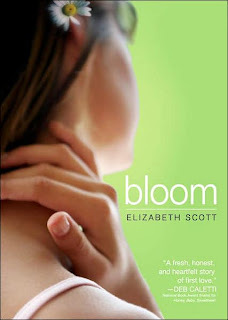 This is my first Elizabeth Scott book and she comes highly recommended. Comparisons to Deb Caletti and Sarah Dessen abound and, as I am a big Caletti fan, I was hoping for a nice, cozy read on a snowy February evening. Lauren is pretty sure she's as average as it gets. The one thing she excels at is playing the clarinet in her school's jazz band, but no one but her best friend Katie even knows she plays at all, so that hardly counts. The one un-average thing about her life is her boyfriend Dave--the golden boy. For reasons unfathomable to Lauren, Dave chose her the year before and they've been together ever since. Lauren spends her days in a pleasant, if rather lackluster fog, walking through life on Dave's arm. Enter Evan--a blast from Lauren's past. His mother and her father lived together for a short time when they were kids and the shared trauma of that experience reverberates through each of them when Evan moves back into town and begins attending Lauren's high school. Bloom was good and I enjoyed it. I kind of flip-flopped with regards to my feelings toward Lauren. In many ways, I really liked her. I liked her dedication to the clarinet and her nervous excitement at being given a solo in the upcoming concert. I liked that it was her secret and I got why she couldn't tell anyone about the one good thing she had going on. She took care of her dad even when he didn't deserve it and she tried (and failed) but she tried to do right by her incredibly nice, incredibly clueless boyfriend. On the flip side, I didn't really like how oblivious she was to her best friend's rapidly disintigrating personal life. I didn't really like how long she let the facade of her relationship with Dave go on. It hurt at least four people more than any of them deserved. Back to likes: I really liked Evan. I really liked the mature (yeah, mature) way he and Lauren got to know each other again. I really liked one particular encounter they had in his kitchen. And I really liked how the two of them approached their parents' collective paranoia and disfunction and chose not to make the same mistakes. Overall, this is a relatively short story with a lot of threads, not all of which were as developed as I would have liked. But it has sweet, humorous, and heartbreaking moments and it was a good read on a snowy February evening. This book is on hold for me at the library and I'm picking it up today. I think it sounds a lot like Sara Zarr's "Sweethearts." janssen, you know I haven't read any Zarr yet, though I've heard a lot about her. Do you recommend Sweethearts? It is a lot like Sweethearts, and I highly recommend Sweethearts. I also really liked Scott's Perfect You and Stealing Heaven. Em, I'll have to pick it up then. Do you have a favorite Scott? Just FYI, as you explore more Scott, her most recent release, LIVING DEAD GIRL, is a far far cry from her usual romantic dramas. It's a totally different type of book, about a severely emotionally, physically, and sexually abused girl who has grown up the captive of a pedophilic psychopath. Be prepared for serious emotional trauma and horror. I couldn't eat for a day after. Everything else she's written is more like this -- fans of Dessen and Caletti, etc. Diana, yay for steamy kitchen scenes! And your warning is duly noted. I'll make sure not to pick that one up on a bad day when I need something cheering. Cause, *gulp*. Hey everybody. I absolutely love this book and i agree with everybody who said it sounds like sweethearts. Actually, for a book project I am comparing Sweethearts and Bloom. Does anyone recall of Lauren's last name in Bloom? Did it mention it at all? Hey Chrissy! That sounds like a fun project. If I remember correctly, Lauren's last name was Smith.